Watch Zuck, Sheryl Sandberg and the rest of the gang go to bat for Facebook in the promo video for its pre-IPO roadshow. For your reading pleasure, I’ve written a sportscaster-style play-by-play followed by some highlights. Check out to learn about Facebook’s mission, products and platform, advertising, finance, and future without having to click past all the SEC disclaimers and sit through the 30-minute video. The roadshow site also hosts the prospectus for investors (embedded below). The prospectus include essentially the same information as Facebook’s S-1 filing to IPO, but with more polished formatting. First we’ve got a brief intro from Facebook’s CFO, and already the video begins to lose the favor of this commentator, as it frustratingly does not allow fast-forwarding or rewinding:. Then Mark Zuckerberg slides in(to) second. “I grew up with the internet. You know in middle school I used search engines like Google and Yahoo and I just thought they were the most amazing thing. This complete symbol of the age we live in, where now you have access to all of this information. The thing that seemed like it was missing was always just people, right. So, the most interesting stuff that you care about the most is actually whats going on in the lives of your friends, or the people around you. And, um, there wasn’t really any way for that to be on the web. People had to share that themselves. That wasn’t just out there ready to be indexed. VP of Product Chris Cox is next up to bat, discussing how when Facebook started, you only had one photo. Your profile photo. But people were changing it a lot. Facebook realized it should let users upload whole albums — the feature that would cause Facebook’s popularity to boom. After a few words about the social graph and The Hacker Way, Zuckerberg and Cox tag-team the Products segment. 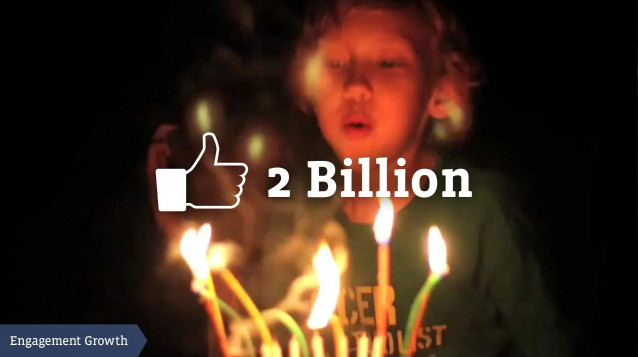 First they take a swing at Timeline, which Zuckerberg calls “the story of your life on a single page”. Next is your personal, always-up-to-date news feed. Looking to keep morale high as they enter the second quarter of the video, Cox announces “We’re now changing within a generation the fabric of how humanity communicates with itself.” Then he follows it up with a flurry of stats, though the video shows its age as some are already outdated. Hoping to gain favor with the roaring crowds of developers, Zuckerberg claims that as much traffic as Facebook gets, the company thinks what other people can build on top of it will be even more important. Long-time teammate The New York Times and new draft pick Spotify are commended for their contributions to the platform. 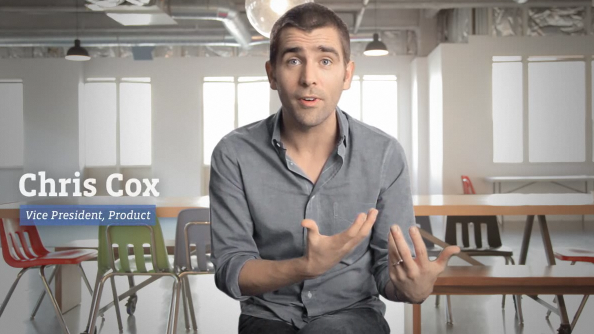 Cox then brings in Facebook’s new bruiser, the powerful but controversial frictionless sharing. This commentator applauds him for his traffic driving abilities and sees his style as the future, but others say auto-publishing in-app activities is fighting dirty. Just before half-time, COO Sheryl Sandberg takes the field defend Facebook’s business model. Name-checking Nike and J.Crew, Sandberg says people connect to businesses just like they do to people. Ben & Jerry’s Ice Cream handles the half-time show, singing that it makes $3 in sales for every $1 it spends on Facebook. 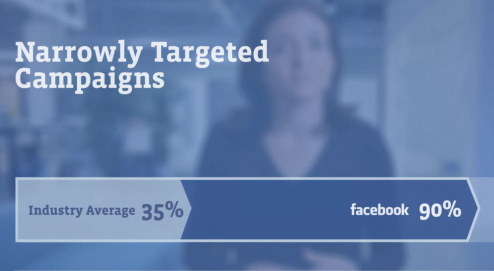 Sandberg kicks off the second half with heavy hitting stats about how Facebook ads are 90% accurate compared to an industry average of 30%. For the 7th inning stretch entertainment, American Express performs a presentation about Small Business Saturday. Facebook subs in its CFO David Ebersman to power through its financial info give its starters a rest. 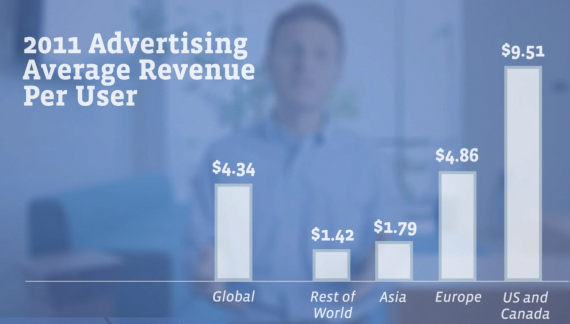 He scores with a previously unseen graph of average revenue per user broken out by geography, and by confirming Facebook may charge non-game app developers less than 30% in taxes on payments. …but wait. Extra innings! 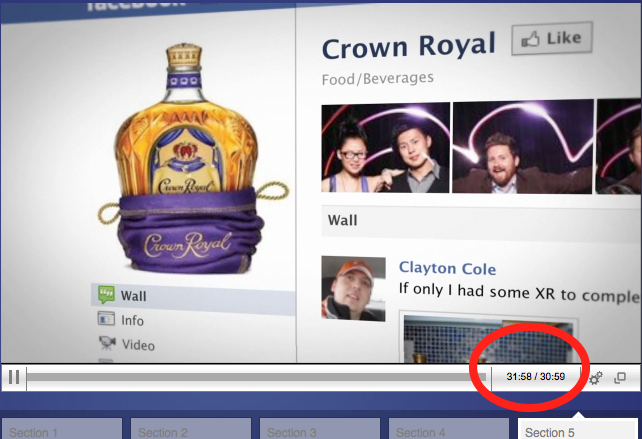 After the video’s listed stop time, liquor brand Diageo makes one last play to convince investors that advertisers are loyal to Facebook. 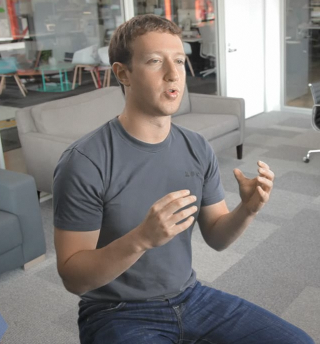 Overall, the Facebook team performed well but dazzle us with many new moves. Cox and Zuckberg had solid ball control, with the CEO looking more nimble and confident than in past season. Ebersman’s late score with geographic ARPU graph was critical, and pinch hitting by Ben & Jerry’s and American Express also deserves a mention. The judges are now making their decisions, and we’ll have to wait until the actual IPO later this month to see if Facebook brought home the win.